Victor didn't want to run while Eli was busy trying to fly. Both will be even too engaged in the research and clearly something goes wrong, if the first chapter is set ten years later in a cemetery where Victor steps towards a grave with a shovel on his shoulder, a mysterious and jump-out-of-nowhere? little girl named Sydney behind and an huge resolution of revenge. Like a character says, "there are no good men in this game" and clearly this is the main element played by Victoria Schwab. Like in others novel, you will root for the villain because essentialy he's the lesser evil between the parts, at least, for me. Let's say that there is a very good character development and we cant't comment it using the "black and white" method of division. Apparently the novel doesn't have anything..extraordinary in its single parts (with one or two exceptions, maybe), but it's the whole that makes it very captivating. At a certain point I was so anxious of knowing what will happen to my favorite characters with heart and mind that I was actually scared for them. I was slowly frying. How can we call it: the emotional partecipation that every author hopes to attain. Besides I liked very much the continue alternations between past and present, even if others are not of the same opinion. And usually I don't like too much the abundance of flashbacks, but in this case the run in two temporal lanes salted really the story and not only decomposed it gratuitously. These were right and efficiencly "organized". 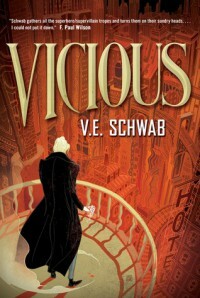 I was sufficiently excited after turning the last page of this book to read with pleasure some posts by Victoria Schwab in her blog. I've ended up liking her too, adding to my to-read list her next book that will be released, A Darked Shade of Magic, whose plot sounds creative and potentially great. So at the end I'm frying again because 24th February 2015 seems so far right now.